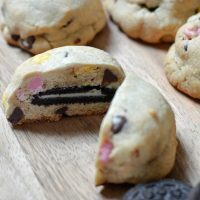 These Oreo Stuffed Chocolate Chip Cookies are simply delicious! They’re so easy to make with your favorite chocolate chip cookie dough recipe, or use premade cookie dough. 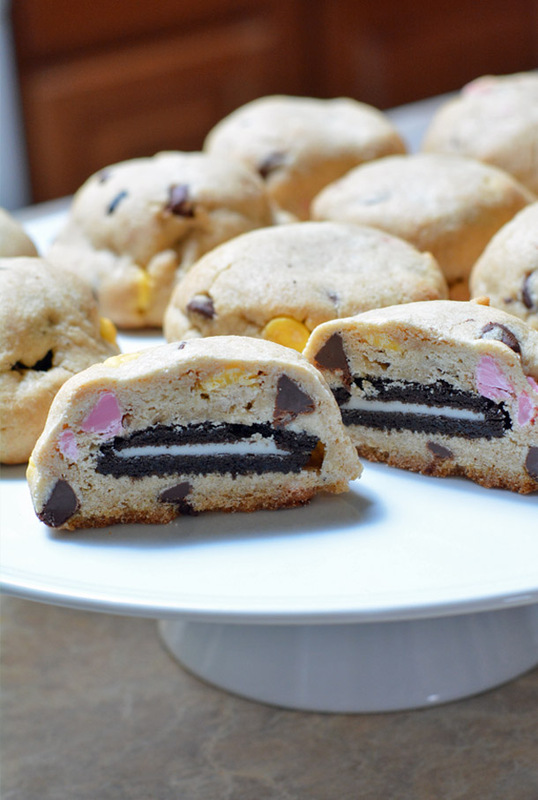 Chocolate chip cookies with an Oreo cookie in the middle! The best of both worlds! I mean..who doesn’t love homemade chocolate chip cookies and Oreos? 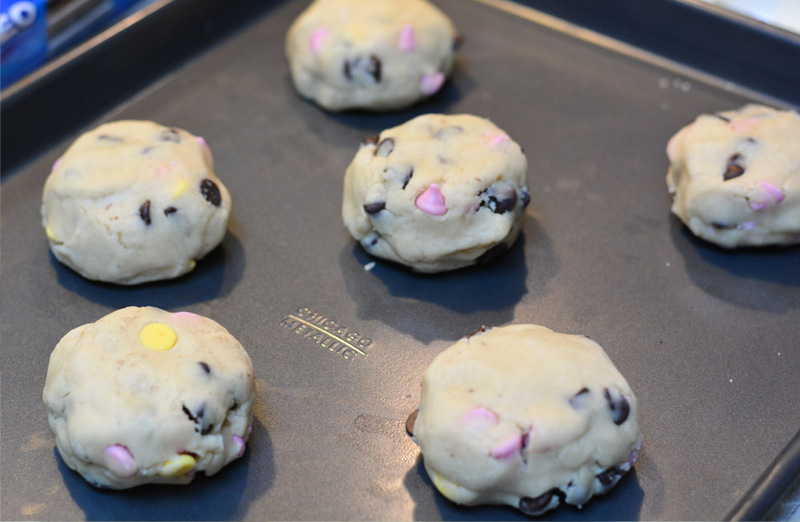 Add a spring theme onto these Oreo Stuffed Chocolate Chip Cookies by baking them with the Nestle Toll House Springtime Semi-sweet Chocolate Baking Chips with Pink & Yellow Colored Morsels instead of the semi-sweet chocolate chips. 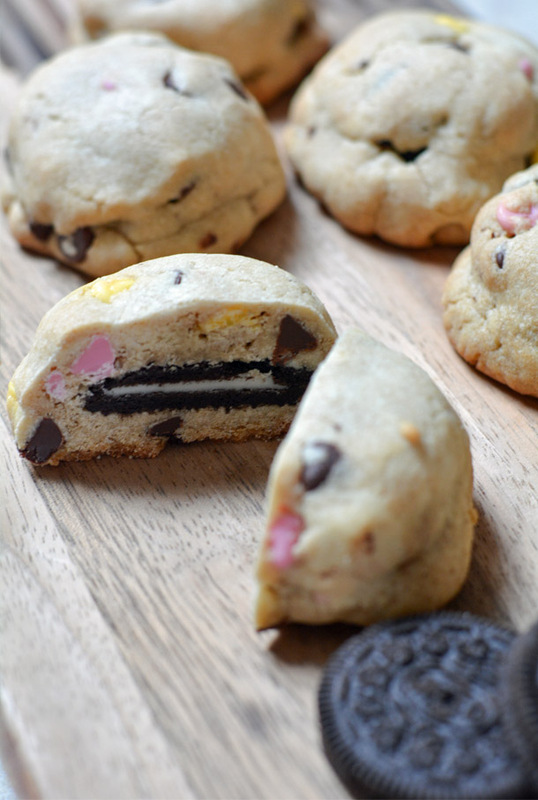 What you’ll need to make these Oreo Stuffed Chocolate Chip Cookies. How to make these stuffed chocolate chip cookies. Add eggs and vanilla, mix until blended. Slowly add dry ingredients to wet ingredients. Fold in chocolate chips. Take one scoop of cookie dough and top it with an Oreo. Take another scoop of cookie dough and place it on top of the oreo. Press the edges together so that you do not see the Oreo. *I like to use my cookie scoop to get the same amount of dough every scoop. Place it on baking sheet and bake 9-10 minutes or until edges start to slightly brown. Let cool 5 minutes and move to a cooling rack. 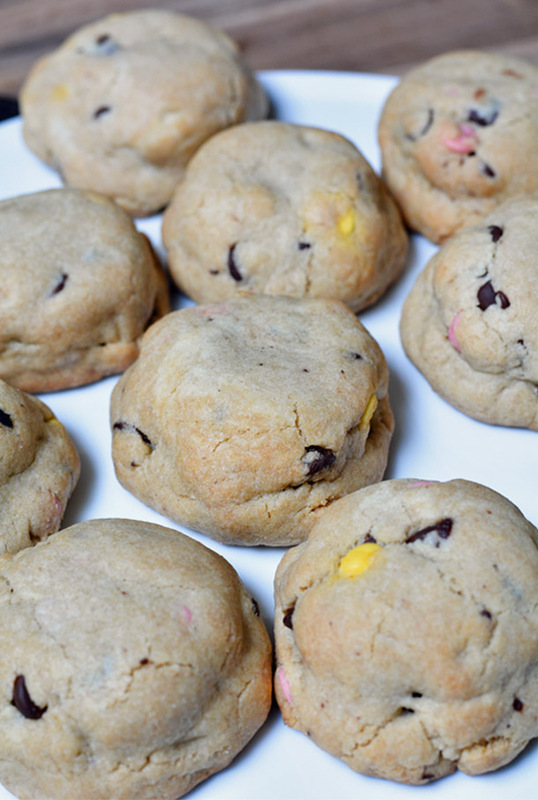 *Keep scrolling for a printable recipe for Oreo Stuffed Chocolate Chip Cookies. These Oreo Stuffed Chocolate Chip Cookies are simply delicious! They're so easy to make with your favorite chocolate chip cookie dough recipe, or use premade cookie dough. I want to make these! They look so good! Chocolate chip and oreos are my fave!